These are the work horse of snaps. Used most often on most heavy leathers. They are also suitable for denim fabrics, canvas, vinyl, or any other sturdy material. 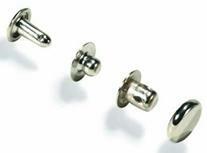 Double cap steel rivets have a finished look on both sides of your project. Again, the workhorse of the industry. When a line 24 snap is too large, this is a great choice. They can be used on most medium leathers, or multiple layers of garment leather. For all your general riveting needs. For a finsihed look on both sides of your project, use double cap rivets instead. For laces, ties, or anytime you need to pass something through a hole and want to prevent wear. These can also be known as line 16 snaps and are used for thin leather, such as garment leather or very light harness leather. They are also suitable for canvas, or for cloth.